Names can be a tricky business. When creating a Neopet, the name you enter can sometimes simply be something random that you decide on in the spur of the moment, or it can be something you’ve been planning on using for a while that means something to you. Either way, the names that we give to our Neopets have never before been as important as they are now. With the added bonus of the ‘Transfer’ option in the Neopian Pound, Neopet trading has become big business, and the most important factor in trades, it would seem, is not the colour, species or even the battle stats of the pet, but is, in fact, its name. Considering this, the question on everybody’s mind is – what exactly makes a name desirable, and how do you know what will give your pet the elusive status of ‘well-named’? Why do people give their Neopets certain names and what makes a name so important to other users? In this article, I aim to both answer common questions about how to make a well-named pet, and also to advise on how to make the best of an imperfect name that one of your beloved Neopets already has as we journey towards to answer of that all-important question – What’s In a Name? Well, I suppose the first thing to think about is how important a Neopet’s name is. Your Neopet’s name is a permanent thing, and so when creating a new pet it is extremely important to put some extra thought into its name – it’s not like you can just cross it out the next day, the name is for life! Therefore, you might consider composing a list of possible names for your new Neopet, and maybe get opinions from friends on which one might be best, or just read over them and see which jumps out at you. The key here is to be patient – you don’t have to create the pet right this second, and you also might want to check that the names you like are all available before you go rushing into creating your new friend. This brings me onto my next point. With all the thousands of Neopets in the game at the moment, a lot of names have already been taken and finding a nice one that is available might be a bit of a challenge. However, this is one of the reasons why nice names are so sought after these days – there simply aren’t many great names left! Users with new accounts are especially keen on trading for pets with nice names as they haven’t had as great a choice of names when creating their Neopets, and so highly value a well-named pet. Obviously, most people have a reason for naming their pets, and this is what we will call the ‘origin’. Everyone has different reasons for naming their pets – the name may be descriptive (e.g. ‘Fluffy’ could describe a Yurble, perhaps), it could be ironic (e.g. if the same name ‘Fluffy’ was given to a Skeith, maybe), it could have a real life name or, more commonly, it could just be a name that you liked the sound of when you created your pet. Unfortunately for some of you with older accounts, the names you liked several years ago may no longer seem as attractive as they once were, and you could now be attached to a Neopet whose name is littered with underscores and numbers. Is this a problem, however? I shouldn’t think so. Sometimes a name with a meaning that brings back good memories can be much more precious than an attractive name that means nothing to you. 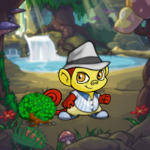 For example, my Shoyru, Studonty_the_second, is named after Studonty, the first Neopet I ever created. Since his name contains 2 underscores, he would be considered to be badly named, but he means a lot to me and I personally don’t have a problem with it. Trading-wise, a good origin can raise the ‘value’ of your pet’s name, especially if there is a good back-story to it, but on the whole it isn’t given the highest priority. For example, will people care if you created the pet in 2004 and so you called it Jimmy_2004 for this reason? For some reason, traders LOVE short names, and people will seriously over-offer for pets with names of the small variety. By short, I mean generally names of 3 or 4 letters, as they are generally deemed to be more attractive. This is because the names look neater, normally sound quite nice and just look pretty good. However, the 3 or 4-letters have to actually form a name, as names such as “zmmx” are just a jumble of letters really and won’t quite count. Long names can also be attractive, especially some female names ending in “a”, but for some reason there isn’t a very high demand for them. However, you could possibly use this to your advantage. Because longer names aren’t advertised very much, your Neopet with its very pretty long name will seem quite rare and unusual and therefore very desirable. Being able to pronounce a pet’s name is VERY important to traders. After all, the whole idea of naming a pet is to give it something you can call it by. The main way to make a name pronounceable is by making sure there aren’t too many consonants or vowels in a row, as people can get confused as to how the name is supposed to be pronounced. For example, if your pets name has something like “aeeieae” in the middle, people won’t understand how it’s supposed to be spoken, which will cause you problems. Also, if the name has something like “ghhdk” in it, the same problem will occur. The biggest influence this has is on 3 or 4-letter names, as these are the names that are in the highest demand. However, there are ways to get around the problem of having a pet with a name that can’t be pronounced. The first is to simply shorten the name. Does your pet’s name start with something that CAN be pronounced? An example of this is a name such as ‘Calffjsdf’, which could be shortened to ‘Cal’ which can easily be pronounced, or maybe even just C. Also, if the name is completely random, you could just make up a nickname for the pet. Obviously, people will be able to see that your pet’s name is unpronounceable, but if you give it a snappy nickname this will really give your Neopet a better edge. Names that are Real Words/Names are EXTREMELY popular and, unless you already have a pet with one of these names, you’ll struggle to create a new one. For those of you who don’t understand what this means, it is basically when your pet has a name that is a word or name in ‘real life’. These can be normal nouns, such as ‘Table’, ‘Pencil’ or ‘House’, or more creative words such as ‘Reverent’ or ‘Indefinitely’. These names, along with ‘real’ names such as ‘James’ or ‘Sarah’, are popular as they are easily recognised and pronounced, and can also provide an origin for your pet’s name (e.g. if you want your pet to be brave and strong and you call him ‘Warrior’). Real Words/Names are extremely sought after, and are probably what you will get the highest offer for, especially if your pets are ‘basic’ (i.e. unpainted and not limited edition). Especially popular with certain traders are names from popular books/TV shows and you’ll be very lucky if you have one of those, as those names don’t tend to stay free for very long. One thing to note is that traders also care about how ‘common’ the word is that the pet is named. Therefore, you might see pets being described as “Common RW” or “Uncommon RN” (Common Real Word and Uncommon Real Name) in order to almost rank their pet’s name in the Real Word/Name spectrum. People also tend to look up their pet’s names on a search engine and then post how many results there are to sort of prove how common the name is. You can do this if you want, but it normally doesn’t make a great deal of difference to people’s opinions on your pet’s name (however, it would be quite fun to ‘compete’ in numbers of results!). One thing that you may have gathered as you travel around Neopia is that people really don’t like it when Neopets have numbers or underscores in their names. The effect of underscores and numbers is really one that makes the name look cluttered and unattractive, especially if they make up the majority of the name. The main issue with lots of numbers and underscores is that the name doesn’t actually look like a name anymore, and instead looks more like a username or codeword. However, if you have a genuine reason for wanting underscores/numbers, don’t feel like you shouldn’t use them. After all, the Neopet you create is YOURS, and you have every right to include whatever you want in its name – just don’t expect it to be very popular with other people! Everything mentioned previously can be completely disregarded if your Neopet’s name hasn’t got a CAPITAL LETTER at the beginning – or at least that’s what a lot of people seem to think. I suppose the reason for this is that the name looks neater, and perhaps looks more like a real name that you would see in real life. ‘Capped’ (as they are often called) names are extremely more popular than non-capitalized names, and the seemingly tiny difference of a capital letter can make a huge difference as to whether a trade will take place or not. My advice would be that, unless you’ve really got a thing for names that don’t begin with a capital letter (it’s your pet, after all), go with a ‘Capped’ name, as it will be greatly more appreciated by the wide community. Well, that brings us to the end of the article as this is pretty much all of the information and advice I can give you on Neopet names! The most important thing to consider, above everything else, however, is to pick a name that you LIKE and WANT. My article had told you how to create a pet that is ‘well-named’, but if you truly want to keep your pet and care for it, I suggest that you pick a name that you like and one that means something to you as well. Of course, you’ll probably want to take the above information into account, but Neopets are creatures, and not items to be traded from one person to the other, so make sure the name you give your Neopet has that one vital, special ingredient – love. DISCLAIMER: The names mentioned in this article are used as examples only, and I am in no way referring to the actual Neopets who may have those names.